Battery Park City, a planned community built on landfill in the 1970s and 80s. 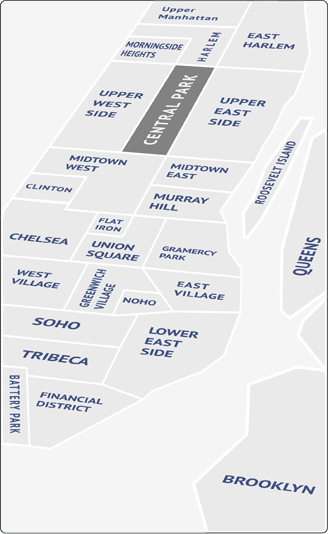 It is bounded on the east by West Street, which separates the area from the Financial District of downtown Manhattan. To the west, north and south, the area is surrounded by the tidal estuary of the Hudson River. The North Residential Neighborhood has a large hotel, Stuyvesant High School, a movie theater complex and a modern branch of the New York Public Library. Immediately to the south lies the World Financial Center. Its tenants include American Express, Dow Jones & Company, Merrill Lynch, and Deloitte & Touche. The ground floor and portions of the second floor are occupied by a mall; its center point is a steel-and-glass atrium known as the Winter Garden. Outside of the Winter Garden lies the North Cove, a sizeable yacht harbor on the Hudson. Enjoy steak or lobster at the Palm, revel in the liberty view at Liberty View or Gigino, or plan your private dining experience at Rise on the 14th floor of the Ritz Carlton (with panoramic views both inside and out. Across State Street stands the old U.S. Customs House, now used as a branch of the National Museum of the American Indian. Battery Park, at the southern tip of Manhattan, has unbeatable views of the Statue of Liberty and Ellis Island. At the north end of the park is Castle Clinton, Pier A - formerly a fireboat station and plenty of memorials. During the Tribeca Film Festival, see a movie under the stars at Drive-In outside the Winter Garden in the World Financial Center. Battery Park, at the southern tip of Manhattan has unbeatable views of the Statue of Liberty and Ellis Island. There is also Robert F. Wagner Park and the Battery Park City Promenade. Together with Hudson River Park, a system of green spaces, bikeways and promenades now extend up the Hudson shoreline. If your yacht isn’t parked in North Cove Marina, you can still take sailing lessons! With post-9/11 rent subsidies, look for this neighborhood to continue growing into a more residential area.